Next Level Events presents Abundance, the freshest party on the block! We’re living through the most rapid transition of human culture in our known history! Abundance is a celebration of this change. As we become more conscious of our universe we begin to move towards that which creates lasting happiness and joy! Our current potion for a conscious evolution in motion brings you world wise beats, superfood treats, herbal elixirs and yoga = thriving community! Dance is one of the most heavenly natural highs available, so come boogie anyway it feels good and let your body take you high! Abundance is now held in one of Aucklands most historic venues, the newly refurbished Campbell Free building in Victoria Park! 8pm - Vinyasa Yoga. Please book in advance for yoga on the “yoga bookings poll” which is on the event wall > 40 max. 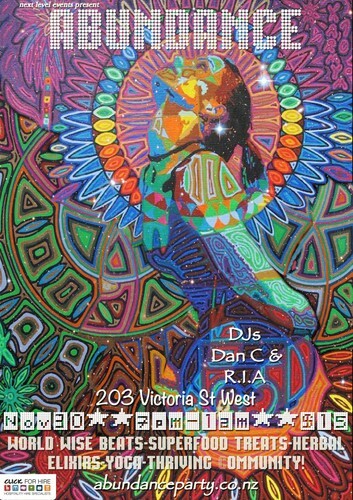 9pm till Midnight - Dance yourself free with DJs Dan C & R-I-A. Serving a melting pot of the world freshest beats. We play all styles for all peoples! Superfood treats and drinks by Wise Cicada chief Brian Cavanagh! > Organic Beetroot, Wild Mint with Pear, Bristly Ox-Toungue, Lemon & Kiwifruit. > Carrot, Lime & Nasturtium with Hound's Tongue & Wild Tulip. > Green Apple, Grapefruit, Plantain, Dandelion, Broad-Leaved Dock, Wild Tulip, Puha, Hound's Tongue, Wild Turnip, Wood Sorrel, Bristly Ox-Tongue, Shining Spleenwort & Beach Spinach!